This entry was posted in Hazardous materials on 2017/07/05 by Susan. Silicosis is a disease that destroys lung tissue. A new online tool helps employers protect workers from exposure to dusts that cause it. Whenever I hear about silica exposure, I’m reminded of the construction worker I wrote about in my post To mask or not to mask. I felt so worried for this stranger. I had been reading about exposure to silica dust released from construction materials such as rock, concrete, tile, and brick. Workers who grind, cut, and haul these materials are at risk of developing silicosis – a disease that destroys lung tissue and impairs a person’s ability to breathe. It usually takes many years (or even decades) to develop. But before I could formulate any kind of warning, the worker got up, went outside, and lit a cigarette. B.C. 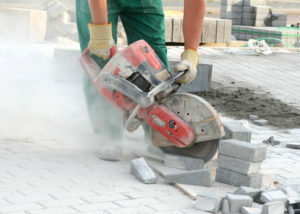 employers must protect workers exposed to silica by developing a silica exposure control plan. To make this task easier, the BC Construction Safety Alliance (BCCSA), in collaboration with WorkSafeBC and the University of B.C., created a Silica Control Tool. Mike McKenna, the BCCSA’s executive director, described to me how the tool helps employers keep workers safe and demonstrate their compliance with the Occupational Health and Safety Regulation in our province. Employers can access the tool via smart phone, tablet, or computer. They enter details about a specific task, including what controls they are using to mitigate risk. From this data, the tool generates an exposure level. If it’s above the allowable limit, employers can try out different controls to see how they can reduce the exposure level, before saving their customized control plan. You can read more about the tool in this article in the May/June 2017 issue of WorkSafe Magazine.